I’VE NEVER MET Bernie, never even spoken to her. 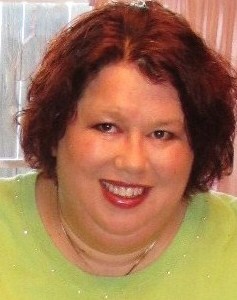 She lives in Billings, Montana, with her husband Roy and their cats. She’s the modern-day version of a pen pal who has become a friend. It all started when Bernie discovered my Minnesota Prairie Roots blog and began commenting on my posts. Naturally, I had to check out her One Mixed Bag blog. There I found a former Minnesotan who writes with honesty and humor in a voice that keeps drawing me back. This woman is laugh-out-loud funny. She makes me smile. She makes me giggle. She makes me think. And sometimes she even makes me cry. More on that later. At some point, and again I don’t recall specifics, our friendship extended beyond blog comments to the occasional e-mail. After reading an especially touching post penned by Bernie, I suggested she submit it to Minnesota Moments magazine. This woman can write. The story will publish in our winter issue. Then, when I created a “Snapshots of Love” contest, with results publishing in Minnesota Moments’ winter edition, I thought of Bernie and the handcrafted vintage style greeting cards she creates and sells through her online shop Budugalee. Even the name makes me laugh. I asked Bernie if she would contribute perhaps a half dozen greeting cards to our prize package. Well, this artist wanted to give more—a card a month, plus. Bernie’s that kind of person. The type who’s giving and caring and kind and generous all rolled into one. That brings us to this week and to the unexpected package that arrived Thursday morning from Bernie. I figured she was sending me some of her handcrafted cards. She did. One. It’s a beauty. The card Bernie handcrafted for me, celebrating my mother's gift of birthday cakes. 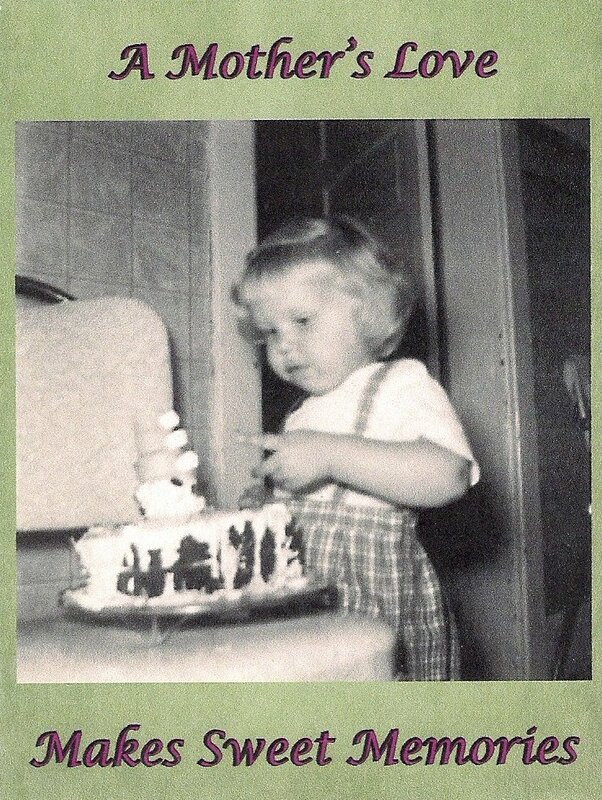 That's me in the photo, on my second birthday. She remembered how, several times in blog posts, I wrote about the birthday cakes my mom created for me and my siblings when we were growing up. My parents didn’t have money for gifts; the cake was the gift, I wrote. Those stories of birthdays without presents and the loving gift of a cake touched something in Bernie. 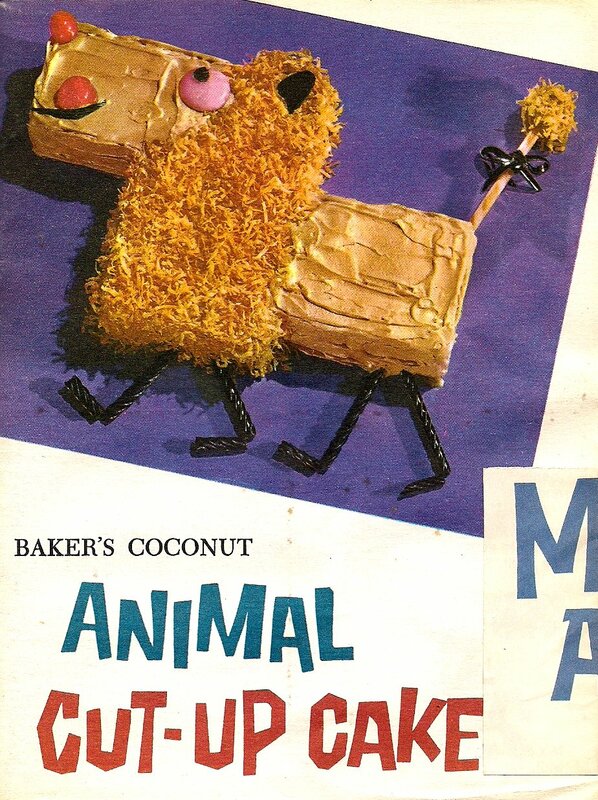 She made it her mission to find a copy of the 1959 General Foods Corporation’s Baker’s Coconut Animal Cut-up Cake booklet that my siblings and I thumbed through each birthday to choose the cake our mother would create. Thursday morning I unwrapped the slim package from Bernie, expecting a packet of her cards. Instead, she gifted me with memories of birthdays past in that cake booklet she found on eBay. The birthday cake booklet from my childhood that Bernie found on eBay. She’s had the booklet for several weeks. TELL ME. When has a friend touched your life with an unexpected, just-right gift given at precisely the right moment? MY MOM IS A PACKRAT, a saver, a keeper. I’ll never change her ways, so it’s best, for the most part, simply to accept that she will save anything and everything. And sometimes I’m glad she does because I’ve come to appreciate links to the past, like the valentines she displays each year in her living room. Aren’t they beautiful? 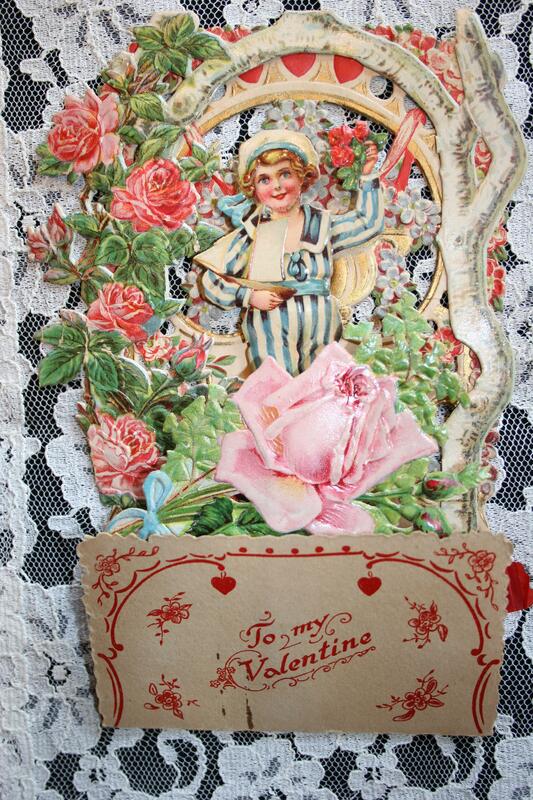 I can’t even begin to compare the valentines of today to the valentines of yesteryear. 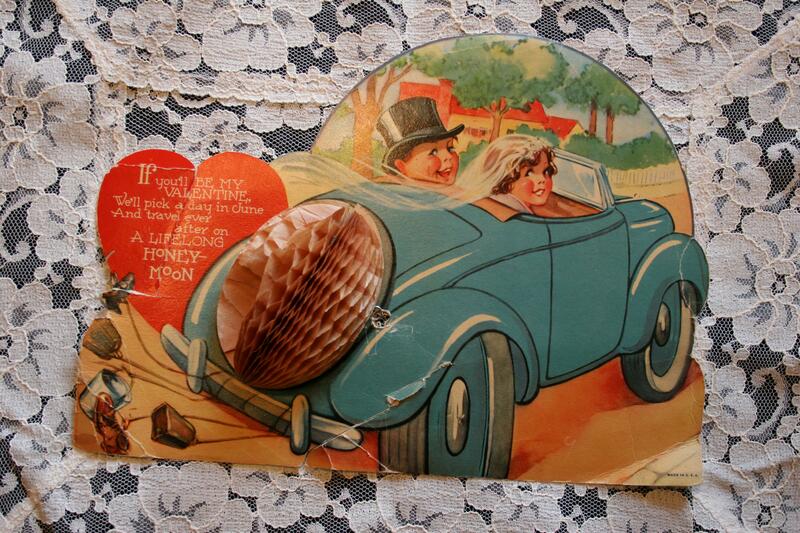 A car valentine belonging to my mom. 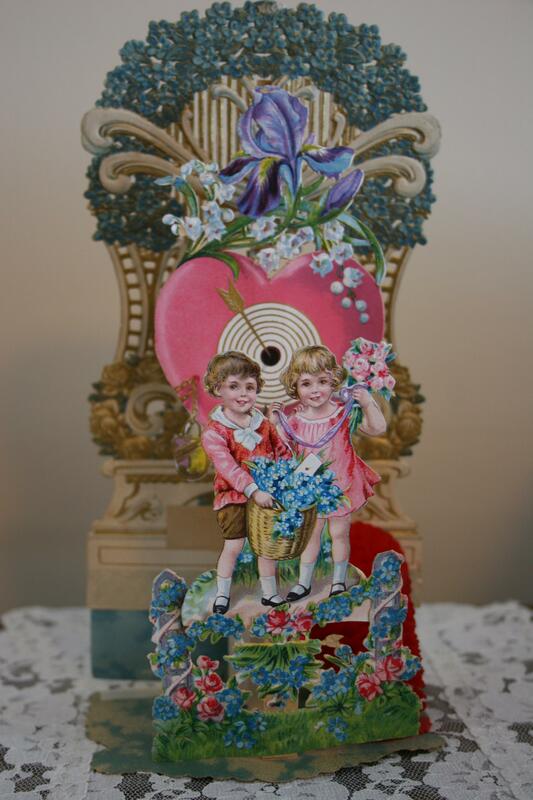 Another of my mom's vintage pop-up valentines. Roses define this valentine my mom received decades ago.